I admit, that although I have a couple of Twitter accounts for work purposes that I use to promote links to my articles, blogs, etc., for the various racing news outlets for which I write, I really don’t pay as close attention to Twitter as I should, again, for work purposes. I did, however, hear yesterday afternoon that Dale Earnhardt Jr. “broke the Internet” with a tweet about his favorite sandwich. While I’m making confessions, here, I admit, I kind of cringed when I heard that NASCAR’s most popular driver many times over “broke the Internet,” not because I hated that he got so much attention for a trivial tweet; the reason for my cringing reaction was the term, “breaking the Internet.” Right or wrong, I associate that term with the Kardashian/Jenner clan. By saying that, no offense to the Kardahians, Jenners or their fans is intended. Heck, I admit I used to watch their E! reality show and some of their various spin-offs. I’ve since lost interest, but that’s beside the point. Soon, curiosity had me checking out Twitter to see what all the fuss was about. Really!?! All this fuss because Junior likes mayo and banana sandwiches!?! When I heard he “broke the Internet,” I assumed he announced his wedding date, eloped, or something like that. News of Earnhardt’s sandwich choice went viral, so-to-speak. Heck, TMZ even covered it. A lot of “news” outlets, some more legit and more respected than others, referred to the sandwich choice as disgusting, gross and other synonyms of those two words. Of course, then I saw tweets, story comments and other posts of other kinds defending the sandwich as a southern delicacy, of sorts. Different strokes for different folks, as they say, I guess. As a lifelong Kentuckian, I consider myself southern. Whether or not Kentucky is a southern state seems to depend on who you ask. Anyway, as far as I know, it’s not a southern delight in my neck of the woods. And, quite honestly, I’m not even a mayonnaise person, anyway, regardless of what else is on the sandwich. That being said, I’m still not going to judge; whatever floats Earnhardt’s boat. What I will say, is it’s a perfect promo for JR Motorsports sponsor Hellmann’s. Granted, his choice of his use of Hellmann’s seemed to gross out some of his fans, apparently. But it definitely got folks talking about mayo. Heck, it even got the condiment some free promotion on popular mainstream sites (see TMZ reference, above). Maybe he should have showcased the Hellmann’s jar in his tweeted photo. 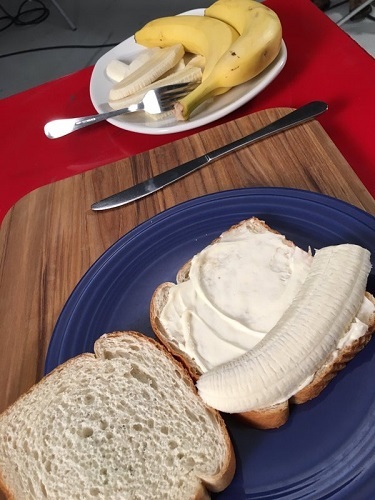 Oh, wait, he did, in a second photo in defense of his favorite sandwich, mentioning how Elvis liked peanut butter on his mayo and banana sandwich. I haven’t seen The King, as in Richard Petty, chime in, but if it was good enough for that other King. . . .
Earnhardt and Elvis for Hellmann’s — well played Junior, well played. Just wondering, will the wedding menu feature mayo and banana finger sandwiches? Follow Auto Racing Daily on Twitter @AutoRacingDaily or like Auto Racing Daily on Facebook (facebook.com/autorcngdaily). Amanda’s also on Twitter @NASCARexaminer and has a fan/like page on Facebook: NASCAR Examiner. That’s okay; we’ll wait until you finish that mayo and banana sandwhich.